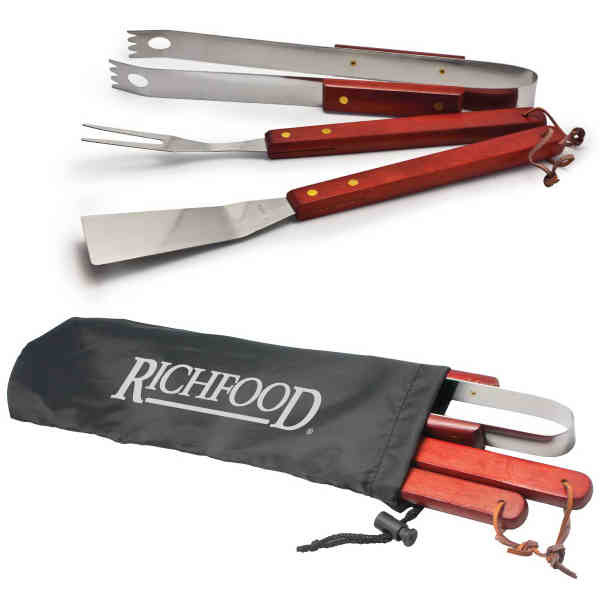 3 piece barbecue set features a spatula, barbecue fork and tongs. Made from professional grade steel with solid wood handles. Double riveted with leather hanging strap. Set comes in a black drawstring carrying bag. Best seller. Sizes: Tongs: 14", Fork: 13 1/2", Spatula: 14". Size: 16.5 " x 5.5 "
Imprint Size:1/2" x 2", 2 1/5" x 8"